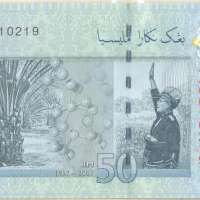 This RM50 banknote is the first in the fourth series of Malaysian notes, which will be replacing existing series in stages. Existing RM50 notes remain legal tender. To commemorate Malaysia's 50th Anniversary of Independence, the 50th anniversary logo appears on only the first 50 million notes. The first 20,000 commemorative RM50 notes (serial numbers ranging from AA0000001 to AA0020000) were packaged in folders and sold for RM60 each on 26 December 2007 at BNM Head Office and all of BNM's branches. The first 20,000 banknotes have gold-songket-strip on both of the edges, while the notes that came after only have silver-songket-strip. 50 million of RM50 banknotes with 50th Anniversary of Independence have the logo on the back and the prefixes are AA, AB, AC, AD and AE. Replacement notes for these prefixes only in ZA prefix, while prefix ZB onwards are for prefixes AF and onwards. SUBANG, Dec 21 2007 (Bernama) -- Bank Negara Malaysia plans to replace the existing banknotes and coins with new designs, its governor Tan Sri Dr Zeti Akhtar Aziz said Friday. "We are in the process of looking for new designs and will slowly replace all the notes and coins," Zeti said. "A study on the new designs is in progress. We have to consider a few factors pertaining to input on our country in the designs," she told reporters here after introducing the new RM50 banknote design to commemorate Malaysia's 50th anniversary of independence. The new RM50 banknote is the first denomination of the fourth series of Malaysian currency notes which will be replacing the existing series in stages. The current banknotes were issued about 10 to 12 years ago, Zeti said, adding that the existing RM50 banknote series would continue to be legal tender. Presently, the banknotes in circulation are in denominations of RM100, RM50, RM10, RM5, RM2 and RM1 while the coins are in denominations of 50 sen, 20 sen, 10 sen and one sen.
Prime Minister Datuk Seri Abdullah Ahmad Badawi launched the new RM50 banknote today. The main theme of the new design is Wawasan 2020 or National Mission 2020 where the first thrust is "to move the economy up the value chain", reflecting Malaysia's economic transformation to higher value-added activities. Zeti said the new RM50 banknote was printed by German-based company which has manufacturing facilities in Canada and Malaysia. "The company was selected after its design won the competition held by the central bank," she said. The new RM50 banknote with special packaging will be available for sale to the public at RM60 per set from Dec 26 at Bank Negara's head office and branches nationwide. A total of 20,000 sets will be available on a first-come, first-served basis and limited to one set per person. The new RM50 banknotes without special packaging will be available through commercial banks from Jan 30, 2008. Pengeluaran wang kertas reka bentuk baharu RM50 ini adalah bersempena Ulang Tahun ke-50 Kemerdekaan Malaysia pada 31 Ogos 1957. Wang kertas ini mengabadikan Malaysia sebagai sebuah negara raja berpelembagaan kaya dengan warisan budaya dan maju pembangunan ekonominya. HADAPAN Motif reka bentuk bahagian hadapan menggambarkan potret Seri Paduka Baginda Yang di-Pertuan Agong yang pertama, Tuanku Abdul Rahman, pada sebelah kanan dan bunga kebangsaan, bunga raya, pada bahagian tengah. Corak reka bentuk daripada tenunan songket pada bahagian latar dan bahagian tepi wang kertas menggambarkan kraf tangan tekstil dan sulaman tradisional rakyat Malaysia. Dengan memasukkan ciri keselamatan terkini, imej pendam pelbagai warna dalam denominasi 50 dapat dilihat apabila wang kertas disengetkan sedikit dan akan bertukar warna apabila kedudukan wang kertas tersebut dipusingkan. Jalur holografil memaparkan denominasi 50 dan bunga raya dengan warna yang membelau dan kesan struktur yang pusam. BELAKANG Rekaan pada bahagian belakang menggambarkan transformasi ekonomi Malaysia daripada sebuah negara berasaskan pertanian kepada ekonomi yang berasaskan perkilangan dan perkhidmatan yang mempunyai nilai tambah yang lebih tinggi. Perdana Menteri yang pertama, Tunku Abdul Rahman Putra Al-Haj digambarkan dalam perisytiharan bersejarah kemerdekaan Malaya. Logo Ulang Tahun Kemerdekaan yang ke-50 diilhamkan daripada bendera negara, 'Jalur Gemilang'. Logo itu melambangkan kejayaan negara sejak mencapai kemerdekaan dan simbol perpaduan pelbagai kumpulan etnik yang dapat hidup bersama. Bagi mengingati ulang tahun kemerdekaan negara, Bank Negara Malaysia telah mengeluarkan wang kertas reka bentuk baharu ini. This new design RM50 banknote is issued to commemorate the 50th Anniversary of Malaysia's Independence Day which took place on 31 August 1957. This banknote captures the birth of Malaysia as a constitutional monarchy, its rich cultural heritage and the success of its economic development. FRONT The design motifs on the front side feature the portrait of the first Seri Paduka Baginda Yang di-Pertuan Agong, Tuankau Abdul Rahman, on the right side and the national flower hibiscus in the centre. Design patterns from songket weaving, which are in the backgroun and edges of the banknote, reflect traditional Malaysian textile handicraft and embroidery. Incorporating the latest security features, the multicolour latent image of the demoniation 50 can be seen when the banknote is tilted slightly and the colour changes when it is rotated. The holographic stripe features the denomination 50 and the hibiscus flower, with a multicoloured pumping and matt-structure effect. BACK The design depicts Malaysia's economic transformation from agricultural to that of higher value-added manufacturing and services-based economy. Malaysia's first prime minister, Tunku Abdul Rahman Putra Al-Haj, is captured in the historic declaration of Malaya's independence. 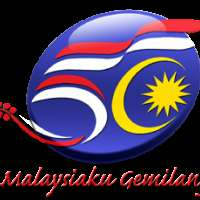 The logo of the 50th Anniversary of Independence is inspired by the national flag 'Jalur Gemilang'. The logo represents the nation's achievement since independence and symbolises the unity of the diverse ethnic groups living together. To mark this anniversary, Bank Negara Malaysia has commissioned the issuance of this new design RM50 banknote.